Our range of electronic shelf labels fit a variety of retail sectors, including, Supermarkets & Groceries, Liquor stores & Bottle shops, Pharmacies, DIY & Garden stores, and Electronic stores..
Our range of electronic shelf labels include tailored options for a variety of retail sectors. Each label has been developed to meet specific retail requirements, for Grocers and Supermarkets, Liquor stores, Pharmacies, Hardware stores, Electronic stores and much more. We offer a wide range of digital label attachments including shelf railings, hook attachments, clips, stands, multipurpose adhesive attachments, and even waterproof casings that can actually be submerged in water! This means whatever your product display requirements are, we have the accessory to fit it. Supermarkets are perhaps the most classic retail environment for a digital pricing solution, due to the high frequency of price changes - discounts and promotions, perishable mark downs, market price adjustments etc. Electronic shelf labels are fixed via clamps and stands to a cheese display. Electronic price labels fixed via adhesive stands, here for a central wine display. We work with bottle shops throughout Australia and are a member of the Liquor Store Association of NSW. Electronic price tags have proven an exceptional investment for bottle shops, due to the ease of pricing and promotional updates. Stores are often run by 1 or 2 staff, with minimal time for price label changes. Some stores also utilise time of day pricing, showing a slightly higher price for evenings and busy periods. A strategy that can only be implemented using ESLs. 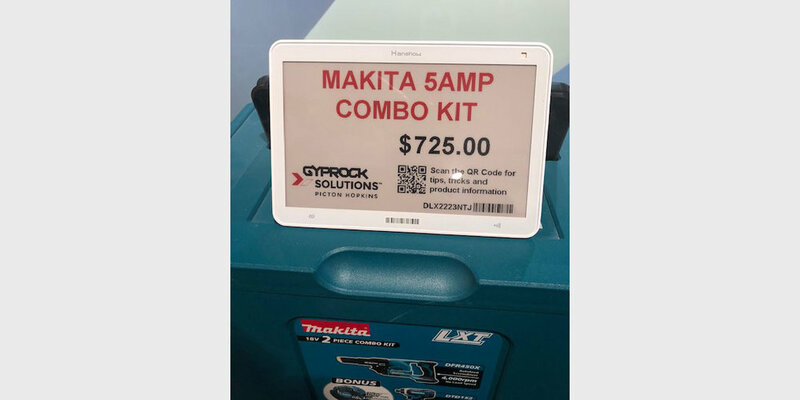 Building, hardware, DYI, automotive and parts stores have been quick to take advantage of the benefits of electronic shelf labels. In addition to real time price updates some utilise the labels to show tiered pricing (standard, club and trade for example), QR codes for customers to quickly view detailed specs, and other information key to the product sale. Internationally pharmacies have widely adopted digital price tags due to the convenience of price and promotion management. 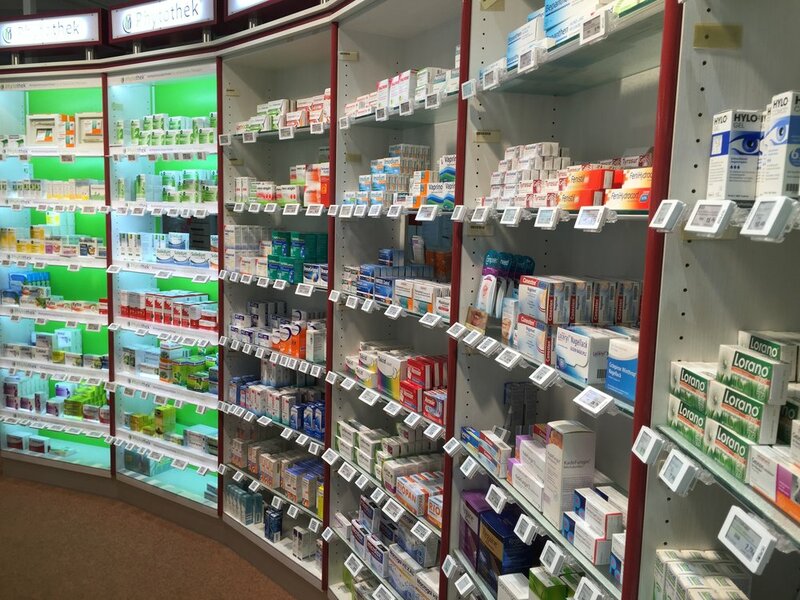 Additional operational and customer experience benefits are also extremely useful for the pharmacy sector, which is often run by minimal staff. We're seeing a wider and wider adoption of digital price labels by electronics stores. Products can be quite price sensitive, mainly driven by competition, so updating prices quickly and easily is vital. Synchronising online and offline pricing is also key for many retailers. QR codes are an important strategy for electronic retailers, giving customers access to further product information via their smart phone. Reviews, full product specs and product comparisons all help convert sales in store. Weekly offers, brand promotions and price mark downs across entire departments stores, can be a lengthy and inaccurate process. Using electronic price tags means these processes can be implemented at the touch of a button, with accuracy assured! 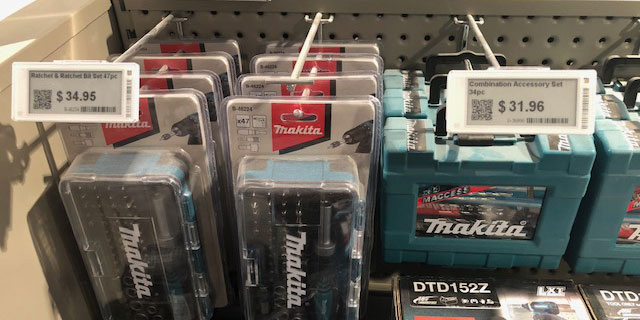 A wide range of accessories enable our labels to be fitted to a variety of different types of products, essential for department and discount stores.